Competitors gather at the start of the Barkley MarathonsIf tales of hallucinations, climbing the equivalent of Mount Everest twice and scrambling through the darkness with only the croak of frogs as your guide aren't enough to discourage hopeful participants, the Barkley Marathons acceptance letter might just do that.It warns would-be entrants to prepare for "failure and humiliation", to expect an "extended period of unspeakable suffering" and to hope you "escape without incurring permanent physical damage and psychological scarring". That psychological scarring, it warns, "will torment you for the remainder of your life".Inspired by the failed jail break by James Earl Ray, the man convicted for the assassination of civil rights activist Martin Luther King and serving a 99-year sentence, the race might well be the toughest in the world. Completing the 'Barkley' has a difficulty level on a par with the jail break it derives from. Hundreds have tried over the past three decades but only 15 have ever been successful. Last year, there wasn't a single finisher. The race has gained an iconic and almost mythical status among the ultra-running community as one of the most gruelling and secretive events in the world,. Competitors are enticed by the idea of completing a race that is almost - but not quite - impossible. 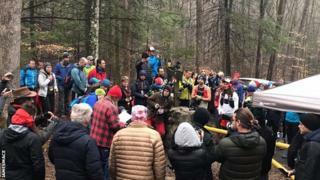 "It draws you in as some kind of fun run and a bit of a laugh but it is an incredibly serious race," two-time Barkley competitor James Mace told BBC Sport. "It just plays on you and eats away at you and that's why people become so obsessed. It's ridiculous how much you want to be back in it after you fail." 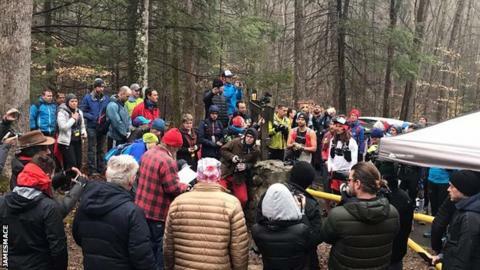 But while the race's popularity has rocketed since documentary 'The Barkley Marathons: The Race That Eats Its Young' aired in 2014 it still only admits around 40 runners each year. Others get the infamous 'condolences' letter. The iconic race fee - $1.60 and a number plate - handed to race director Gary CantrellTwo-and-a-half days after scaling a 12ft barbed wire-topped wall to flee jail, James Earl Ray - was tracked down all of eight miles from the confines of Brushy Mountain State Penitentiary. In 1985, Gary Cantrell was reading about Ray's failed escape bid eight years earlier and discovered the prisoner - who had previously bust out of jail in a bread truck - was found face down in the undergrowth after being defeated by the park's treacherous terrain.Keen ultra-runner Cantrell, also known as 'Lazarus Lake', believed he could cover at least 100 miles in the time it took Ray to be found.He set about creating a race named after his friend Barry Barkley, tweaking and experimenting until settling on five loops of a 20-mile course (or three loops for 'fun runners') and giving runners a 60-hour limit to finish it.However the real test is not the distance, but the elevation change. Completing the Barkley is the equivalent to climbing up and down Mount Everest. Twice. "You need to prepare as if you are doing a serious expedition to Everest," said Edinburgh-based Mace, whose previous feats include the six-day Marathon des Sables and Ultra-Trail du Mont-Blanc (UTMB).In his race report[/i] from last year, accomplished ultra-marathoner Gary Robbins said Rat Jaw - one of the toughest climbs - was an "absolute soul destroying grind from bottom to top" while heavy rained turned its "clay like dirt into a vertical skating rink". [/i]This race requires one if not two years of absolute dedication.James MaceBritish ultra-runnerEnglishman Mark Williams, who said he was fuelled by cheese sandwiches as he became the first person to complete the 100-mile epic in 1995, admitted he had to lie down four times during the penultimate lap as he was "hallucinating quite badly and practically falling asleep on my feet".Mace, who said he expected the Barkley to be "horrendous" but was still underprepared, added: "Like everyone on their first time, you think it's going to be like any other 100-miler: 'I'll get into it and I have my race strategy'. "I know looking back at it now that the very first step I made it went wrong from there. "On every lap, runners have to collect a page from the 13 books hidden around the unmarked course - which includes a dash through a tunnel at the now defunct prison. With no GPS, only a brief time to study the map and with limited notes on where to find them, this can prove tricky. "We just got lost, every single book," said Mace of his first attempt, when the race began at 4am in the traditional manner of Cantrell lighting up a cigarette. "To locate the first book we had to listen to the frogs that were in this pond - pitch black, already off course. It was just awful. It dismantled people. "You barely get any sleep anyway, you're nervous and then the horn goes off. It completely disorientated everybody." "I'm working on map and compass skills and also using kit I wouldn't usually whip out - poles, shoes resoled with studded grip in case it's very wet, gaiters for bracken and briars that can lacerate your legs - they're a bit like shinpads! "I've been carrying 12 to 15 hours' worth of stuff. If something goes wrong out there, it's just you. "Mace, who hopes to compete again in 2020, says he feels he now knows what is required to tackle the Barkley. "I used a similar training plan to other events but I believe that training was only really worthy of getting me past the first loop and into the second loop," he said. "A lot of people are serious ultra-runners who are very competitive. It draws you in but this race requires one if not two years of absolute dedication."